Marks/Label: There is a label on the backing card which says "shellwork from Jamaica 1908". Narrative: Belonged to Rose Snare of Wolfville, mother-in-law of the donor. She received it from Mr. Kingdon of Wolfville in the late 1960s or early 70s. 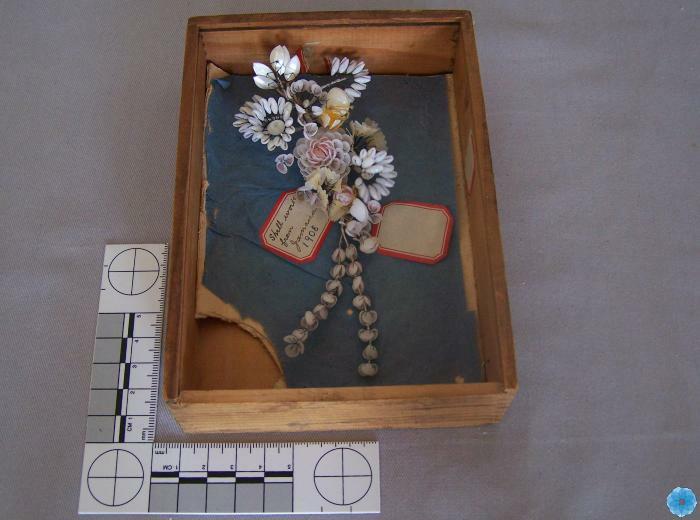 Description: A cluster of small white, grey and pink shells ending in a spray; secured by thread to blue tissue paper card glued inside a small bevilled wooden box with a sliding top.